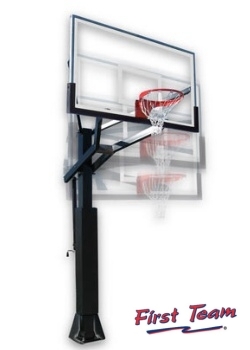 The PowerHouse series of basketball systems was designed with performance, aesthetic appeal and economy in mind. The unit is built with a one-piece 6" x 6" vertical post that incorporates our bolt-down anchor base for ease of assembly and relocation. The rim height is infinitely adjustable by simply turning the EZ Crank handle. Rim height adjustable from 7' to 10'. The rim height indicator shows the height of the rim. Our Y-shaped extension arms and steel perimeter framed tempered glass backboard combine with First Team��s exclusive CLEARSPAN�� backboard mounting making PowerHouse the most powerful and aesthetic units available in their price range! 36" backboard to post extension.